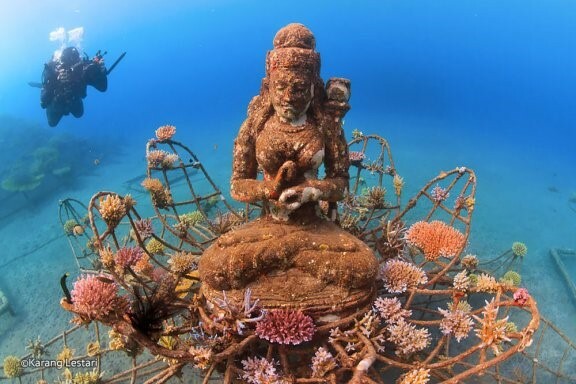 The coastal area of Pemuteran Bay in Bali’s northwest is not only a premier diving site, but home to a renowned biorock project, overseen by the Karang Lestari Foundation. The bay has the largest area of shallow coral reefs in Bali due to its calm waves year round. You can easily enjoy the views of spectacular coral reef growth near the coastline. Hotel and dive shop owners collaborated closely with the village to protect the area, and The Karang Lesteri Project took off in June 2000, establishing the first coral nursery. Now, divers can enjoy expansive artificial reef gardens built over time, and even ‘adopt’ a coral with a structure built in their name.